This artist's concept shows a possible explosion resulting from a high-speed collision between a space rock and Jupiter's moon Europa. A new look at data from a NASA spacecraft has revealed evidence a colossal impact on Jupiter's moon Europa, a collision that may have delivered key minerals and perhaps even the raw ingredients for life, scientists say. The cosmic crash scene, which NASA billed a "spectacular collision with an asteroid or comet," is the first time clay-like minerals have ever been detected on Europa. The discovery is based on a new analysis of images from NASA's Galileo mission to Jupiter and is intriguing to scientists because comets and asteroids are often carriers of organic compounds, which can serve as ingredients for primitive life. Scientists have held that Europa — one of more than 60 moons that circle Jupiter — may be one of the best places to look for extraterrestrial life in our solar system. Beneath its icy outer crust, the moon is thought to be hiding a saltwater ocean. Scientists have suspected that Europa is also home to organic materials, the carbon-based materials that make up the building blocks of life like proteins and DNA. Shirley and colleagues made the discovery while looking at 15-year-old near-infrared images from NASA's Galileo spacecraft, which arrived at Jupiter in 1995 and circled the gas giant for eight years. This image, using data from NASA's Galileo mission, shows the first detection of clay-like minerals on the surface of Jupiter's moon Europa. The clay-like minerals appear in blue in the false-color patch of data from NASA's Galileo spacecraft. Areas rich in water ice appear in red. 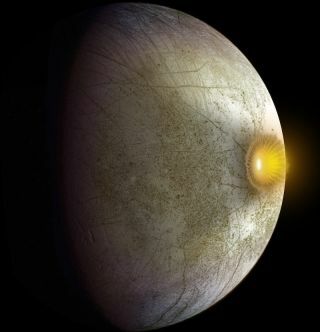 The researchers say it is unlikely that these phyllosilicates on the surface came from Europa's interior; the moon's thick outer shell, up to 60 miles (100 kilometers) thick in some areas, would present a formidable obstacle. Instead, this broken ring may represent the splash-back of ejected materials scattered over Europa when a space rock hit the moon's surface from a shallow angle, the scientists say. The phyllosilicate formation was located about 75 miles (120 km) away from the center of a 20-mile-diameter (30 km) crater site, the researchers say. Based on the size of this crater, the researchers think it may have been carved out by a 3,600-foot-wide (1,100 meters) asteroid, or perhaps a 5,600-foot-wide (1,700 meters) comet (similar in size to the recently deceased Comet ISON). Another JPL scientist, Bob Pappalardo, who is working on a proposed mission to Europa, said researchers will need future missions to the moon to understand the specifics of Europa's chemistry and what it might mean for the possibility of life. "Understanding Europa's composition is key to deciphering its history and its potential habitability," Pappalardo said in a statement. The research, which was funded by a NASA Outer Planets Research grant, will be presented on Friday (Dec. 13) at the American Geophysical Union meeting in San Francisco.